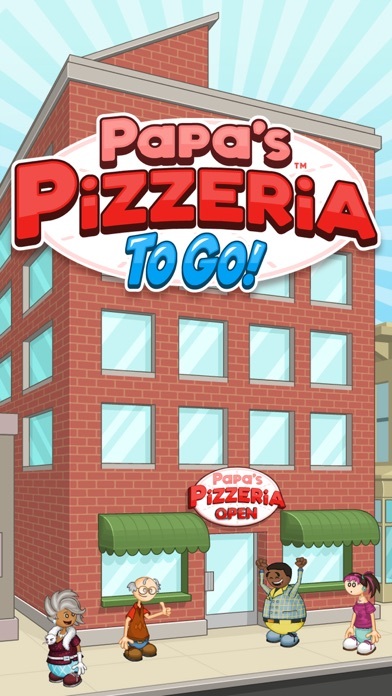 App Report for Papa's Pizzeria To Go! Things get messy when you’re stuck running a wildly popular pizza parlor in Papa’s Pizzeria To Go! 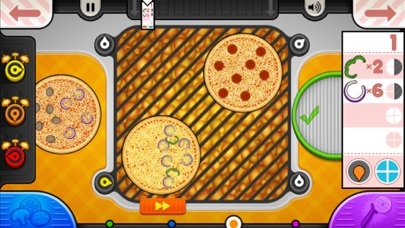 Top, bake, and serve pizzas in this award-winning game that’s reimagined for iPhone and iPod Touch. You'll need to multitask between each area of the pizzeria, with new controls designed to work just right in the palm of your hand. Head to the Order Station to watch for customers waiting in the lobby. Switch to the Topping Station to add a variety of toppings to each pizza. Move to the Bake Station to cook the pizzas in the oven until they're baked just right. 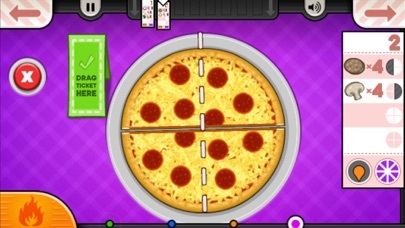 Jump to the Cutting Station to cut the pizza into perfect slices. Each station is a hands-on experience, where you'll need to drag, swipe, and tap your way through the pizza-building process. Keep your customers happy to earn more points and level up. As your level rises, you'll unlock new toppings in the shop, and new customers will start visiting the Pizzeria! A well-crafted pizza also earns you tips, which you can spend on upgrades and decorations for the lobby! 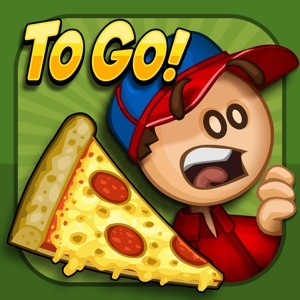 ** NEW FOR PAPA'S PIZZERIA TO GO ** Papa's Pizzeria To Go is redesigned and reimagined for smaller screens, so your fingers don't get in the way of the action! CONTROL WITH YOUR THUMBS - You'll switch stations using buttons in the corners of the screen, perfect for your thumbs. You can also use buttons in the top corners to quickly switch Order Tickets, and you can view all of your Order Tickets in a zoomed-in mode for easy reading. TOPPING STATION - We've completely redesigned the Topping Station for smaller screens. Bins of toppings can be scrolled with your thumb, which allows us to have many more toppings than in the original game. 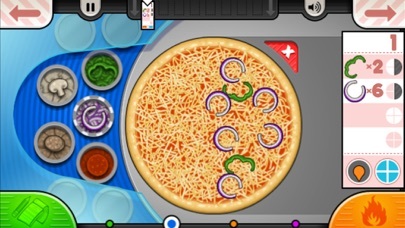 Tap on a bin to select that topping, then tap multiple times on the pizza to add items directly onto the pizza. You don't need to drag individual toppings onto the pizza, so you can top faster than ever! A quick swipe on the pizza will send it off the to the Bake Station. BAKE STATION - Papa Louie's coal-fired oven gets an upgrade! You can buy new Oven Alarms in the Shop to help you keep track of pizzas in the oven. Simply drag an alarm onto one of the oven timers, and you'll hear an alert when that pizza is cooked just right. Buy new Oven Boosters to cook your pizzas even faster than before! CUTTING STATION - When it's time to cut pizzas, simply touch and drag a line across the pizza to decide where to cut. If you want even more control to fine-tune your slices, you can also cut using multi-touch! Use two fingers or thumbs to move each end of the line at the same time, and release to slice your pizza. If you're having trouble cutting pizzas at the right angle, buy a variety of Cutting Guides in the Shop to cut that perfect slice! NEW INGREDIENTS - We've added a ton of new ingredients which can't be found in the original Papa's Pizzeria. As you play the game, you'll unlock 26 unique ingredients to serve your customers! CUSTOMIZE YOUR LOBBY - You can spend your hard-earned tips in the Shop, where you can find a variety of posters, furniture, and wallpaper styles for your lobby! 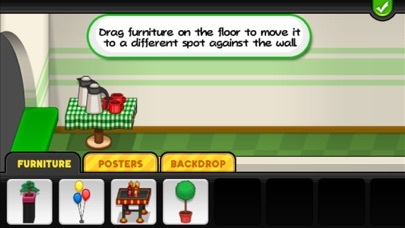 Use the brand-new Lobby tool to add items to your restaurant, and move and arrange them however you like! Choose from over 140 customization items, and every item you add to the lobby will improve your Waiting Score for your customers! UPDATED FEATURES - Serve picky closers at the end of the day, earn paychecks as you play, and try to please the finicky Food Critic to earn a Blue Ribbon! **GAME FEATURES** Hands-on pizza shop in the Papa Louie universe All new controls and gameplay designed for smaller screens Multi-task between topping, baking, and cutting Shop to buy upgrades, furniture, and posters using your in-game tips New Lobby Editor to customize and decorate your shop 90 customers to unlock with unique orders Challenging Closers and Food Critic 75 in-game achievements to earn **NOTE FOR iPAD USERS** Papa's Pizzeria To Go is designed especially for smaller screens. Category Ranking Trends for Papa's Pizzeria To Go!